Union Street Café is part of the Gordon Ramsey Group located just down the road from The Shard, in a fairly quiet spot in Southwark. My visit here was actually over a month ago now and I have been trying to work out what has kept me from writing about it sooner. I think it’s perhaps because I don’t actually have loads to say about it. This doesn’t however mean that I think it’s a bad restaurant, I think it’s a good restaurant, I enjoyed my meal and they’re currently running some pretty reasonable set menu deals. It just wasn’t the most stand out eating experience I’ve ever had, but I do want you to go there so I’ll fill you in on my thoughts. 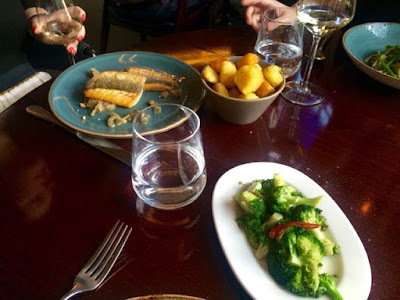 I visited Union Street Café to have a catch up with the girls and as each of us work in different parts of London and finish at different times, this can often be chaotic to organise. Of course we all were running slightly late and arrived at different times but the staff were very accommodating and one of the girls and I passed the time in the bar downstairs while they kept our table open for us in the dining room until we all arrived. It turns out, the basement bar here is actually a bit of a hidden gem. Decked out with Turkish style rugs, with low sofas and large edgy artwork on exposed plaster walls, it feels like a bit of a den. There’s something a bit cool and forbidden about it as if you’ve gone to the exclusive back room for lock-in. There’s a good cocktail menu and I’d like to visit another time for drinks. We ordered what was then the £25 summer special set menu. They now have a very similar one billed as the pre/post theatre menu. Ours included a carafe of wine each, the offer now comes with a signature cocktail instead. Not bad value for a celebrity chef restaurant. 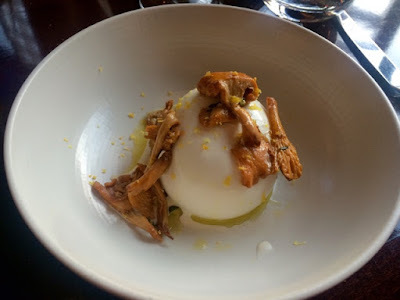 I began the evening with the burrata which was delightful as I’ve never had it before. I’ve often wondered what makes it so special and separates it from a ball of mozzarella. However I was pleasantly surprised as the creamy milky centre transforms it into something totally different. It’s hard to explain to people who haven’t eaten burrata that it’s not just a ball of cheese, but it is so worth trying as you’ll understand how it becomes a dish in itself. The accompanying girolles were really tasty. I’m a big fan of mushrooms. Moving on to the main meal, I think this may be the reason I’ve refrained from writing this up until now. There’s not a lot to say about it. The picture (above) does sort of speak for itself. It was pasta, with a courgette sauce. The flavours were not particularly outstanding but it was fine. I had no problem with this dish. There’s just nothing to separate it from a basic pasta dish I might make at home. 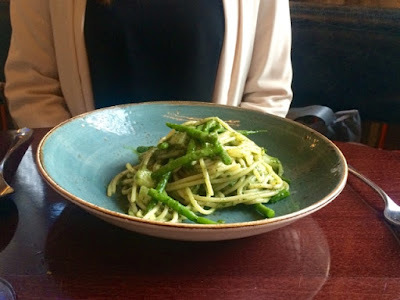 The basil pesto spaghetti looked slightly more tasty and the sea bass was quite small, it needed sides (which cost extra). None of the main courses were bad, but nothing was amazing. Dessert was another story. On telling us the special gelato they had on that day the waitress went into a detailed description about the chocolate flavour, explaining that it was from a very specific type of cocoa bean, and then went on to say ‘…and the other flavour we have today is mushroom.’ … with no further explanation. Obviously I was intrigued and asked more about it. My curiosity whet, of course this is what I ordered, opting to have a scoop of the chocolate flavour as well… just in case the mushroom was hideous. I have no idea what I expected from it, who does have expectations of a mushroom flavoured gelato? I was pleasantly surprised. It was odd, it was sweet which was unexpected, but it also very definitely tasted of mushroom. It was really nice. 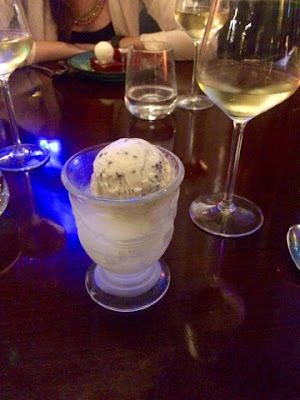 It’s very hard to describe, but if anyone ever offers you mushroom flavoured ice cream be brave, give it a whirl. 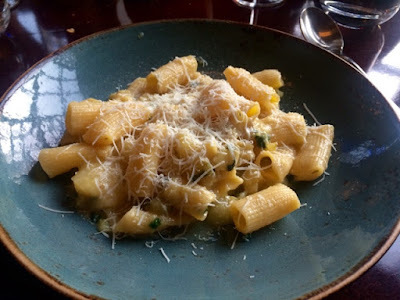 I had a very pleasant evening at Union Street Café Perhaps I would have been slightly more impressed with the à la carte menu, but the set menu is a good deal for an easy night out and the starter and the dessert were very good even if the mains were average. It’s a pleasant environment and the staff were helpful, they knew the menu and the dishes and they were attentive. It doesn’t make my list of favourites but I’d go again. I’d like to try the à la carte menu to find out if they have more to offer on the food front.